Natural stone can be the material that can make all the difference in world when it comes to building a beautiful landscape. Natural stone can be utilized to create water features, steps, fireplaces, seat walls, columns, outdoor living spaces such as outdoor kitchens, patios and bars. Natural stone can be installed in variety of ways, including dry stacked on a compacted gravel base or mortared to a concrete base/footer. In dry stack applications, no mortar is used to allow for small movements caused by freeze and thaw cycles. In mortared applications, natural stone is mortared to a concrete base/footer and mortar is placed in the joints. 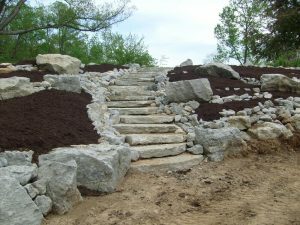 Dean’s Landscaping has the knowledge and experience to design and install your project properly to last many years through the freeze and thaw cycles in the Miami Valley area. Let’s get started on your natural stone project.